On Monday, June 4th @ 2:41pm our second little girl was born via csection. It's not what we had planned and not my desired birth plan but ultimately, it needed to be done. Both of my births ended this way and honestly, I'm content with it. I could sit here and cry because I won't ever get the birth I wanted but why do that? Why waste my time thinking about something I can't change. And ultimately both my daughters and myself were safe and that's what matters MOST. I am realizing more and more that God truly is in control and He cares for my family. His hand, once again was in this situation and I learned to trust Him once again. I always wanted that "natural" no pain meds birth and I thought I'd be super disappointed but really, I couldn't be happier. Why should I be upset? Yeah I didn't get to hold my babies right after birth or even have them in the same room as me my entire hospital stay but God knew what He was doing. And I am so thankful for His plan working out and NOT mine. Csection is not ideal...no one wants one but it's obviously my way of getting my children out and I'm thankful that I am having babies in a time where it's completely safe. Anistyn's Birth Story:(Some info may be TMI) Starting Saturday night, I was in hospital with contractions 2 minutes apart ALL night long. They started as 7 min apart around 11am then by 5pm they were 5 min apart then by 9pm, 2 min apart. We thought it was the "real deal". When we got to the hospital they quickly hooked me up to machines and checked me. I was only dilated to a 2.5 and 60% effaced. By 3pm Sunday afternoon, I was exhausted and sent home with orders to come back at 6:30am Monday for an NST(non stress test) and more PIH blood work(high blood pressure stuff). They were concerned with Anistyn's heartrate dropping some on monitors and my platelet count. By the time we got home around 5pm...my contractions had pretty much subsided which was crazy because I thought for sure it was the real deal. :/ I was excited to get home and see Tynlee since it was the first night I'd ever slept away from her. I tried my best to play with her when I got home but I was asleep on couch by 6pm due to no sleep the night before. Pure exhaustion. I felt bad so when I went to bed around 8:30, I grabbed Tynlee from her crib and let her cuddle in bed with us...we all slept great all night. I am sure thankful I did that and I don't feel bad at all because little did I know, it would be 5 days before I saw her :( Stephen and I got up around 5:15am and my sweet mother inlaw came to watch Tynlee. I peeked in Tynlee's room since we put her in crib when we woke up and said "I love you" a million times and picked her up and just held my sweet sleeping baby on my shoulder. There was a little notion in my mind that we may leave the hospital this time with a baby. It was just a thought. And with me, you just NEVER know! We got to the hospital and I got all hooked up to contraction monitor and Anistyn's heart rate monitor.. The lab quickly came in to draw my blood work and then it was just a waiting game. By 9am, Anistyn's heart rate had dropped in the 90s a few times. I was scared to death. They said it could be cause she may be coming down canal. My blood work came back and platelets were 108. Normal range is 140-450. Same thing as last time with Tynlee. For some reason, I have low platelets and even when I'm not pregnant they are on lower end. I was soooo thankful my wonderful Dr. Clare was on-call that day...he did Tynlee's csection and was scheduled to do mine on the 15th with Anistyn since that was the plan since my BP kept spiking into 150s over 90s. The nurse came in and said "Your not going home today...your having a baby" with an IV bag in hand. Stephen and I looked at eachother and knew something wasn't right being as I was only 36.4 weeks pregnant. She said your platelets are dropping and so is baby's heartrate so Dr. thinks it's best to csection and not risk VBAC since lower platelets could mean hemmorage and Anistyn may not tolerate it. All those contractions for nothing. Oh well though!! Thankfully it wasn't an emergency and we were told it would be around 11am. Well I didn't end up going back until 2pm. I remember everything this time. I walked into the freezing surgery room and looked at everything I could possibly see. Soaking it up, I guess. I sat there for about 5 minutes on the surgery bed. Then the worst part.. the spinal. OUCH. I leaned against a sweet pregnant nurse as it was placed. First time he hit a nerve and my leg about shot off my body. When the anesthestic goes in, you feel a shooting pain down your crack..literally. Bee stings then a hugeeeee burn. No fun!! But by golly, it had to be done...I was being cut open for Heaven's sakes. Major surgery. I was then placed on the table and instantly went numb & tingly. My doctor walked in and surgery began. I even remember then saying "incision" and "ruptured bag of water" etc. I was SO alert this time...way different than last time. and this time my hands weren't tied down. Stephen came in and I felt complete peace. He kept asking if I was okay because this time I felt soooooo much pressure..like the baby was being pulled from my mouth...it was crazy. I couldn't breathe. "It's a Girl"!! Dr said. "Nucle cord 1˝ I heard. and I began to panic. She was pale when they held her up for us to see. 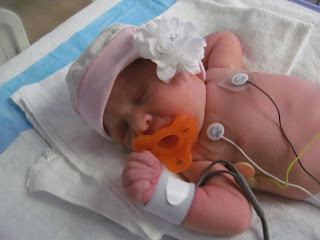 I was prepared for her to go to NICU since she was a 36weeker and its standard but I didn't expect this..she was sooo pale and limp. 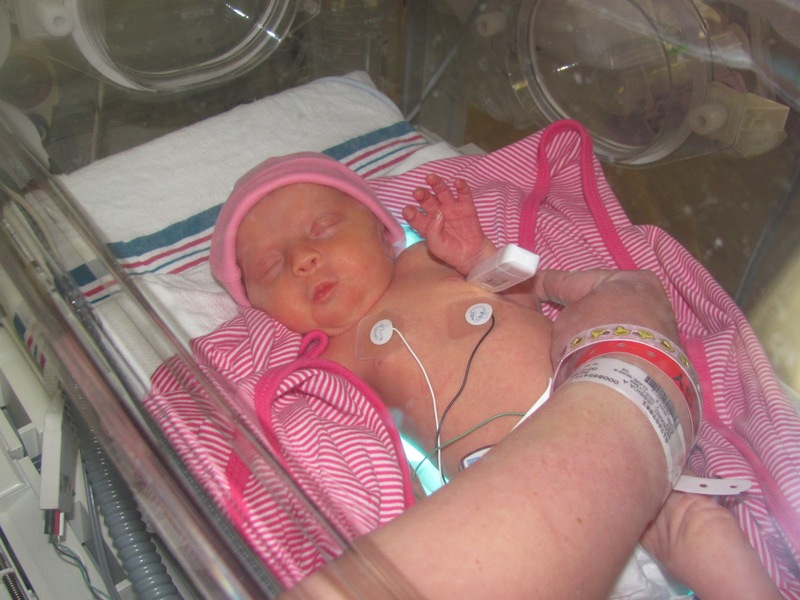 She was quickly thrown through the NICU window. 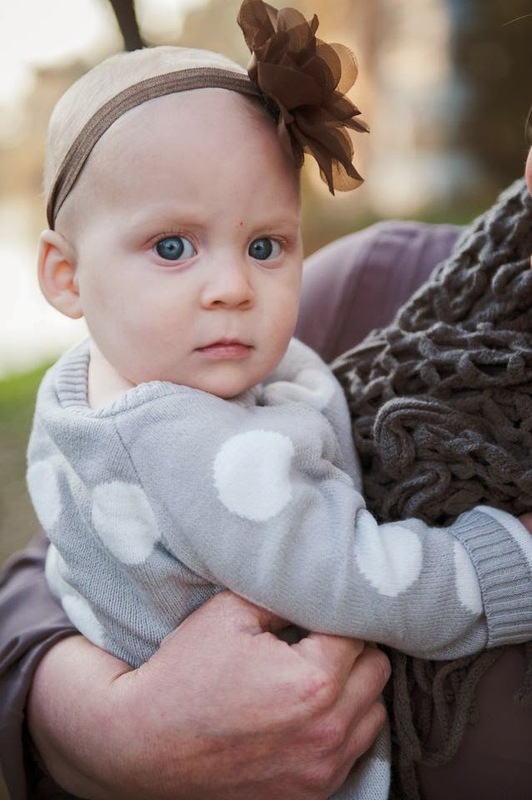 "She looks just like Tynlee" my sweet husband said. He then left to be with her while I was getting my wonderful stomach sewed up again. Dissolving staples on inside and glued outside. Soooooo nice not having to get staples taken out. Dr. Clare is the BEST. Same incision as last time and I am healing VERY well once again. He congratulated me and I was sent to recovery. Still yet to see my baby only for 5 seconds. I was in recovery for 2 hours while they had to start the dreaded magnesium again for my blood pressure. It really wasn't as bad as last time. I only had it for 16 hours this time. 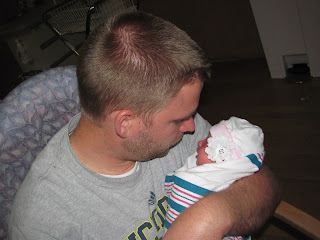 I was then able to be wheeled in on recovery bed to Anistyn's side in the NICU. I held her and poor thing was grunting and had bubbles coming out of her mouth from all the fluid. Broke.my.heart!!!! Of course...I only got to be with her for less then 5 min. then I was taken to my postpartum room upstairs. Da ja Vu I tell ya! Since I was on magnesium for the blood pressure, they wouldn't let me go back down to see her till I was off of it and I wasn't sure when that would be. I was CRUSHED. Away from BOTH of my daughters. Talk about torture, once again! My husband stayed the night with me. I was taken off magnesium around 6am and allowed to go see my baby around 10am. FINALLY. I was able to try nursing and she did pretty good. The doctor came to see her and said she would probably be with me in room tomorrow. I went down every 3 hours at night to feed her. I never wanted to leave her. and everytime I called Tynlee, received a picture or video of her, I lost it. I missed her like crazy. and I never thought i'd have to spend 4 nights away from her. She didn't come to the hospital. I figured she wouldn't remember anyways and too little to understand even though I really wanted to see her. The days dragged on. Everyday seemed the same. I stayed in hospital as long as possible and got released Friday afternoon. I was excited to see Tynlee. but sooo hard getting in my car with an empty carseat. I already knew what it was like to be in my room without my baby and hearing everyone else's baby's cry since Tynlee wasn't with me last time either but leaving without her and not knowing when she can come home was HORRIBLE. I got in the car, looked at Stephen, and balled the whole way home. Hormone drop+leaving without your baby=cry fest. I got home and I grabbed my little Tynlee and balled like a baby, once again. She seemed so big. She kept kissing me and I didn't want to put her down ALL night. I was getting introuble by my mother in law and husband for picking her up but hey, I felt fine! I even let her sleep with us. OOoops!!! but guess what...I don't regret it!!! It won't be like THIS for long, right?!?! SOAK IT UP I TELL YA! 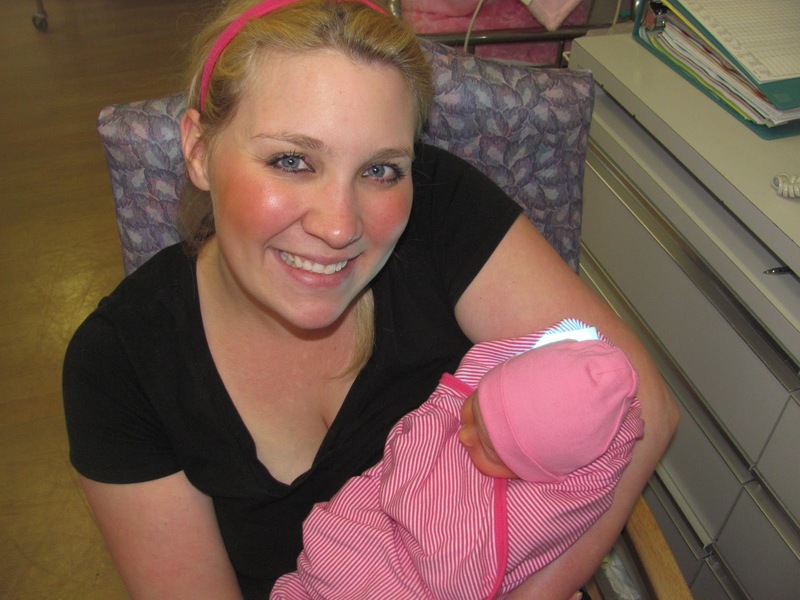 Anistyn's first nurse was a lady i've known for a long time which was really cool. 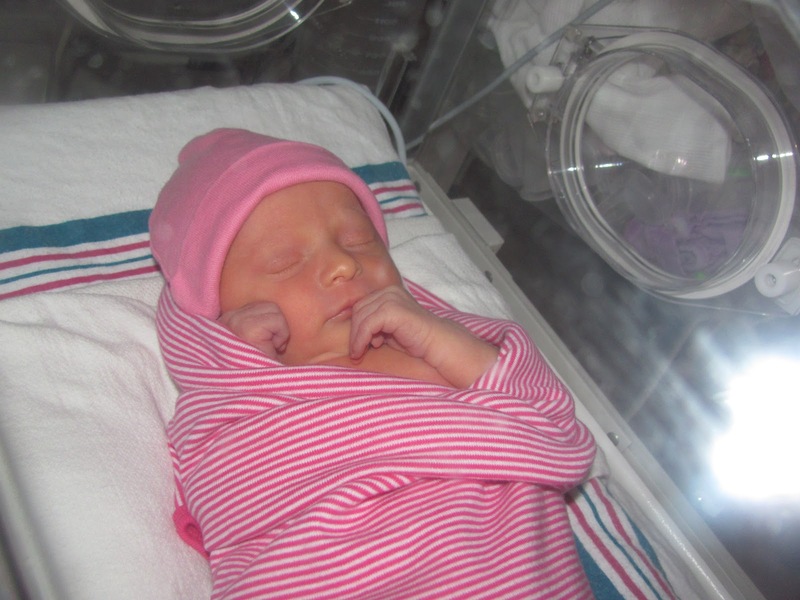 Anistyn then had another issue pop up...jaundice and regulating her body temperature. Since she was only 5.6 lbs, She didn't have a lot of fat yet. She got down to 4 lbs 12 oz. She was eating like a champ either by breast or my milk in a bottle. My milk came in the 2nd day. I guess it's because I only stopped nursing Tynlee two months ago! I was pumping 5 oz bottles in less that 5 minutes with one breast....Stephen was saying "Your body doesn't know how to be pregnant but it sure can produce MILK" lol...I have so much, I am sooo thankful for it too!! She had to go in an incubator to stay warm. It was so sad seeing her in there but she was so cozy and warm. It was the hardest week of my life. Literally. Her bili rueben level only got to 8 and Tynlee's was almost 12 and her temperature was kept all day and night Saturday. I begged the doctor to take her home and what we could do to make it happen. she said lets take her off bili lights and put her in open crib and if her bil doesn't sky rocket tomorrow and temp stays up...she could go home Sunday. I was excited. but dissappointed leaving her another night. we drove back and forth to that hospital a hundred times this pregnancy it seems and in one week probably 25 times...seriously. Even when I came home I went to nurse her @ 1:30am...I didn't care. She was my baby and I needed her. I felt torn though. Leaving one baby for another and visa versa. I cried everytime I had to leave either of them. Hardest week on my life. Pure joy and pure sadness at the same time. Stephen dropped me off Sunday morning to nurse Anistyn @ 10:30, him and Tynlee weren't on the road for more than 10 minutes when I called and said "TURN AROUND, WE ARE GOING HOME!!!" We were all overjoyed to put it lightly. I had to go over some things with nurse and sign paperwork. Then our sweet nurse who had been caring for Anistyn for a few days, walked me and Anistyn out the door to meet Tynlee & Daddy. Tynlee met Anistyn and I instantly fell in love once again. It melted my heart. Sitting in the back seat with both of them on the way home just staring at their sweet little faces, I lost it, once again. God is SO good to my family. We may have drama filled pregnancies, crazy birth stories, etc but ultimately, we are healthy and we are happy. I am so thankful we serve a Mighty Savior who cares for us and guides and leads our family. I don't know how people deal with these types of things without him. Without prayer. I am so thankful for those who came to visit us in hospital, brought us meals, helped with Tynlee, and most importantly, our prayer warriors!! We are all home..healthy...and happy! Tynlee is adjusting well with Anistyn. I'm thankful for the age she's at cause she really doesn't seem to care much. But she is so gentle with her "baby" and she kisses her head so sweetly and says "Hi baby" in the CUTEST stinkin' voice ever! I just melt watching Stephen with his girls. It's the best thing on earth watching your husband become a father once again. You fall in love with him all over again and love him even more than you thought you could. Children truly are a gift from the Lord and I am thankful He saw it fit to bless us with two beautiful healthy daughters...They are our world!